It was knit by his great-grandma, and I added the white lettering last year. 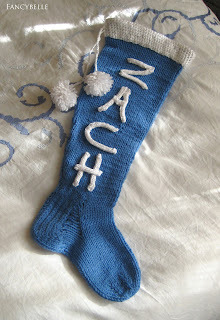 Now all it needs is a good liner so the whole sock doesn't sag and stretch under the weight of Zach's Christmas goodies! I just started sewing it using a swatch of blue flannel. This is something I now realize that I should've googled beforehand instead of diving in scissors first, like I typically do. Oh well, it's coming along...very slooooowly. Okay...now, onto some wonderful crafty links handpicked just for you! An absolute favorite of most knitters I've met online, and a terrific place to share project photos and find tutorials. Awesome community, plus many local yarn shops are active here including my neighborhood place, Knit'n From the Heart. I subscribe to their weekly emails and always end up clicking on some free pattern or new stitch ideas. Sometimes it makes me actually want to learn crochet too! This is a great one for video tutorials and inspiration for your own knitting pattern creations. Since I can't get enough of her book, Itty Bitty Nursery, I'm on this site more than ever before! Good spot for knitting supplies that aren't available in a store by you, I'm on it all the time researching prices for needles and trying to figure out what I'll need for my next project. Gorgeous blog for people who are into sewing, knitting, embroidery and quilting. The Purl Bee is the online journal of Purl, a shop devoted to beautiful materials and tools for crafters. I absolutely love their articles, tutorials, and ample project ideas! An online sewing circle forum, a must-see for free patterns and connecting with other crafters. Sewing Mamas provides a wealth of free sewing information, ideas and support no matter what the project. Love! Similar to Ravelry, but encompasses so much more than knitting. Their motto is: No Tea Cozies Without Irony. Har! Check it out for craft swapping opportunities, patterns, instructions and a seemingly endless supply of project photos. 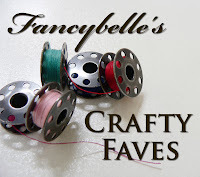 Don't forget to see the second half of my Crafty Faves, to be posted next Wednesday!